CIS - College for International Studies was founded in 1981, an American University, is located in the very heart of Madrid in one of the loveliest parts of the city. Our building is easily accessible and in an extremely safe area. 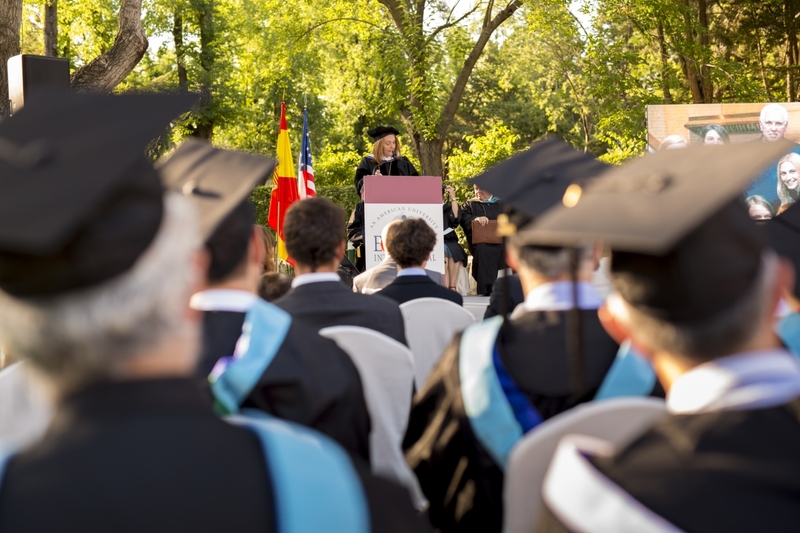 We take great pride in offering European students an American higher education closer to home just as much as we do in offering Americans precisely what they are used to, only here in Spain. CIS-Endicott Is an uncommonly tight-knit learning community, which is often described as “like a big family.” Administrators and professors do everything they can to ensure that our students are comfortable as we guide them through what will ultimately be one of the biggest events of their lives in an exceedingly international setting — in many cases in a foreign country. Every member of our staff and faculty at CIS- Endicott have lived and studied abroad, so we understand the needs of our non-Spanish students who make Madrid their temporary home, as well as the needs of our Spanish students who will ultimately finish up their Bachelor’s Degree elsewhere. The American Higher Education System has been implemented around the world at some of the best, and most successful institutions on the planet. Lower risk of academic failure. Since young people seldom know with 100% certainty what they want to be doing ten years from now, students are not required to be locked into an area of study, in some cases, as early as their sophomore year of high school. In fact, students are not even required to definitively choose upon beginning college. Students are encouraged to choose a focus or major, but certainly not penalized should they change their mind during the first two years of their studies, which mostly involve general education requirements that are nearly universal for all degree programs. By year three, students are required to make a decision, but then again, students in year three are typically in a better position to make such a determination. It is very easy to change degrees programs because the general courses that are required in all majors offered at CIS-Endicott remain consistent whether a student is studying business or journalism. Likewise, should a student change from business to journalism, the business courses satisfy the free electives included in general coursework. This truly is the most flexible system in the world, and we believe young students need time and freedom to discover who they are instead of being academically locked into something they could one day regret and resent. The credit system is consistent among American Colleges and Universities around the world, so transferring is also relatively simple. Students organize and design their own course schedule under the supervision and guidance of our experienced deans. It is based more on the practical application of concepts than theory. We profoundly believe that students learn better by actually doing what they are studying than they do by simply attempting to memorize data. The data is important, but there needs to be a less abstract way of thinking about it in order to make sure the information is truly learned. There are weekly assignments, so studying is done daily as opposed to cramming at the end of semester for exams. Developing study skills in such a way tends to become a lifelong asset. Continuous evaluation favors consistency and encourages students to do their best even if they perform worse-than-expected on an exam or project since they have a multitude of opportunities to demonstrate their knowledge and ability. Students are motivated by many short term goals, as well as by being largely responsible for their own study schedule and workload. Since 1995, CIS - The College for International Studies has worked closely with our academic partner, Endicott College, a partnership that allows students enrolled in CIS to receive Endicott College credits. Every year, 40% of our full degree-seeking students transfer to Endicott College’s campus in beautiful Beverly, Massachusetts to finish up the final two years of their Bachelor’s Degree. Upon completion of their first two years at CIS-Endicott Madrid, students are offered the opportunity to apply for a transfer to any American university in the world to finish their degree, stay with us for select programs, or transfer directly to Endicott College in Massachusetts, as many of our students logically do. Located approximately 30 minutes from Boston, Massachusetts. More than 2400 students attend each year. Large American campus with its own beaches, cafeterias, gyms, study rooms, dining halls, student residences, sports fields, stores, and everything a student could ever need right on campus. It’s comparable to living in a small city. Very safe campus for foreign, and national students. An overwhelming majority (95%) of CIS students who ultimately graduated from Endicott College in Massachusetts tell us that the experience was both academically and personally enriching and that they highly recommend Endicott College. The Bachelor Degree in Business Management is designed to develop an authoritative perspective and personal leadership skills that successful business managers need. From supervisor to CEO, this track helps students become effective managers in complex environments. Internships are an integral part of the curriculum. Through experience real-world experience, students learn how to prepare for their future professions. Possible internship roles include human resource management, consumer product management, retail management, and non-profit management. Through their course work, students undertaking Communications explore the many ways media impacts the individual and society, locally and internationally. Students are provided with a solid academic background that promotes written and critical thinking skills, as well as theoretical and applied knowledge. Internships are an integral part of the curriculum. Through actual work experience during the program, students are better prepared for their future professions. Possible internship roles include those in cinema, TV and radio production, advertising and marketing activities, as well as written and online press production — plus much more. This program offers students the opportunity to attend college in Spain at one of the best-known colleges in the US (CIS-Endicott International) while playing soccer on a professional level. The Elite Soccer University Program is a joint endeavor that brings together higher education and high-performance soccer training. The Elite Soccer University Program is designed for students from around the world who wish to pursue their studies at a reputable American college, while simultaneously participating in high-performance soccer training that is focused on the overall academic and professional athletic improvement of the student.